Identify the front face of the transponder. It displays your agency label and two upward-pointing arrows. (Fig.-1) This side faces the driver with the arrows pointing toward the roof of your vehicle. Identify the position in your vehicle in which the transponder will be mounted. This is between the exposed edge of the windshield (nearest the roof line) and the center seam (Fig.-2). Having determined the mounting position in the vehicle, clean the inside surface of that section of the windshield if necessary. Now carefully remove the red protective backing from the Dual LockTM mounting strips on the rear of the transponder as shown in (Fig.-3) and firmly press the rear of the transponder against the glass. Maintain the pressure for about 15 seconds to achieve a good bond. The transponder may be removed by lifting any one corner with sufficient pressure to separate the Dual LockTM strips. Do not remove the Dual LockTM from the windshield and reuse it; obtain new strips from your service center if necessary. Identify the position in your vehicle in which the transponder will be mounted. The preferred location is between the exposed edge of the windshield (roofline) and the rear view mirror post—as long as the clearances in (Fig.-2) can be maintained. If there is insufficient room, the alternate location shown in (Fig.-3) must be used. Having determined the mounting position in your vehicle, clean the inside surface of that section of the windshield if necessary. Now carefully remove the red protective backing from the Dual LockTM mounting strips on the rear of the transponder as shown in (Fig.-4) and firmly press the rear of the transponder against the glass. Maintain the pressure for about 15 seconds to achieve a good bond. The FME transponder is recommended for trucks, buses, coaches, RVs, and other classes of large commercial vehicles. FME transponders programmed for Rooftop mount on the roof of the vehicle only. For reliable operation of the transponder, the vehicle must be equipped with only one correctly mounted transponder while passing through a toll facility. Other transponders present in or on the vehicle must be switched off or enclosed in an RF shield. 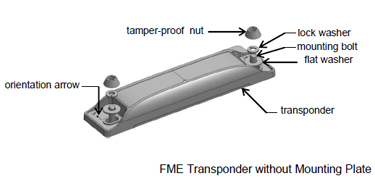 FME transponders must be mounted in the location for which they were programmed. FME transponders programmed for License Plate must be mounted on the front of the vehicle. FME transponders programmed for Rooftop must be mounted on the roof of the vehicle. The mounting location must provide direct line-of-sight communication between the transponder and the toll facility’s overhead antenna. FME transponders cannot be used where local regulations prohibit externally mounting transponders on the roof of the vehicle. Apply the 3M™ VHB™ acrylic foam tape that is on the back of the mounting plate in accordance with 3M™ document 70-0704-8701-5. Do not mount behind horns, lights, or other metal objects. Do not mount within 6 in. of any metal object (trailer, decals, horn, lights, or metallic paint-cover surfaces). Do not mount within 2 ft. of any radio transmitter. Do not mount more than 13 ft. above roadway. A non-metal air dam may cover the transponder provided that no metallic paint or metal foil decals cover the dam. The back of the mounting plate is covered with 3M™ VHB™ acrylic foam tape. Prepare the mounting location in accordance with 3M™ document 70-0704-8701-5. NOTE: Ensure the mounting plate is installed on the vehicle so that when the transponder is installed on the mounting plate, the orientation arrows on the transponder point in the direction of forward travel. Remove the protective backing from the adhesive on the back of the mounting plate and firmly press the mounting plate against the mounting surface with either a roller or platen pressure, maintaining pressure for 15 seconds to ensure a good bond. Using the supplied tamper-proof nuts, lock washers, and flat washers, secure the transponder to the mounting plate with the notches on the transponder and mounting plate aligned and with the orientation arrows on the transponder pointing in the direction of forward travel. NOTE: The transponder mounting holes must be used when securing the transponder to the roof of the vehicle using this method. Place the transponder in the selected mounting location. Using the transponder mounting holes as a guide, mark the locations on the roof through which the mounting bolts will pass. Remove the transponder. Drill a mounting bolt hole at both locations marked in step 1. Using two, ¼- in.-diameter stainless steel mounting bolts of sufficient length, two tamper-proof nuts, two lock washers, and two stainless steel flat washers, secure the transponder to the roof of the vehicle with the orientation arrows on the transponder pointing in the direction of forward travel. Apply sealant to the mounting bolts and mounting location as necessary. The FME transponder is recommended for trucks, buses, coaches, RVs, and other classes of large commercial vehicles. FME transponders programmed for License Plate mount on the front of the vehicle only. 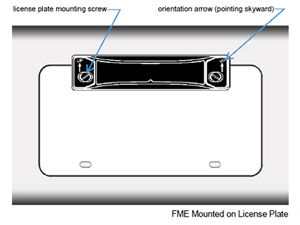 FME transponders cannot be used where local regulations prohibit externally mounting transponders on the front license plate, front bumper, or other external surfaces. The presence of certain classes of front impact-absorbing materials used in the construction of the vehicle may affect the operation of the FME transponder. The mounting location must be free of such materials. a minimum of 24 in. clearance if bumper or large object extends 7+ in. (A1). a minimum of 15 in. from the top of the transponder to the roadway for front bumper mounting. the transponder must be mounted within 4 in. of the vehicle center. Remove the two upper license plate mounting screws securing the license plate to the front of the vehicle. Using the license plate mounting screws removed in step 1, secure the transponder, with orientation arrows pointing skyward, and the license plate to the front of the vehicle. NOTE: Ensure the mounting plate is installed on the vehicle so that when the transponder is installed on the mounting plate, the orientation arrows on the transponder point skyward. Remove the protective paper from the adhesive on the back of the mounting plate and firmly press the mounting plate against the mounting surface with either a roller or platen pressure, maintaining pressure for 15 seconds to ensure a good bond. Using the supplied tamper-proof nuts, lock washers, and flat washers, secure the transponder to the mounting plate with the notches on the transponder and mounting plate aligned and with the orientation arrows on the transponder pointing skyward.